Bombardier will sell the Q Series aircraft program for $800 million to a wholly owned subsidiary of Longview Aviation Capital Corporation. At the same time, the Canada-based company said the de Havilland trademark would go to CAE for $300 million. A new US airline start-up has announced a commitment for 60 Airbus A220-300 aircraft, with deliveries beginning in 2021. This new airline is backed up by a group of experienced investors led by David Neeleman, founder of JetBlue, investor in TAP in Portugal and controlling shareholder in Azul airlines in Brazil. The closing of the previously announced C Series transaction between Airbus, Bombardier and Investissement Québec has come into effect. airBaltic welcomed its ninth Bombardier CS300 jet, registered as YL-CSI, to Riga. By the end of 2018, the Latvian airline plans to have a total of 14 CS300 aircraft on its fleet. Having received all required regulatory approvals, Airbus, Bombardier and Investissement Québec have agreed to close the C Series transaction effective on July 1st. airBaltic and Bombardier Commercial Aircraft have announced that the parties have executed a firm purchase agreement for the sale and purchase of 30 Bombardier CS300 aircraft. The deal also includes options for an additional 30 aircraft of the same type. In a surprise decision, the International Trade Commission has found that the aviation industry in the United States is not “materially injured” by the import of 100- to 150-seat civilian aircraft from Canada. The decision means Bombardier will not have to pay a proposed levy of over 200 per cent to import its C Series jets to the United States. airBaltic carried over 260,000 passengers in December last year, or roughly 27 per cent more than in the same period of 2016. The figure is the largest number of transported passengers in December in the Latvian airline’s history. United States secretary of commerce Wilbur Ross has found in favour of United States-based manufacturer Boeing in a dispute over aircraft sales. Ross ruled Canada-based Bombardier received government subsidies and sold its C-Series jets below cost price in the US, a step likely to lead to tariffs of more than 200 per cent on the plane. Unions representing Bombardier workers in Canada and Northern Ireland will meet with Bombardier chief executive Alain Bellemare to discuss the on-going trade issue with Boeing involving C Series planes. Delta Air Lines chief executive Ed Bastian has stated the American carrier will not pay “any” tariff on the purchase of C Series aircraft from Bombardier. 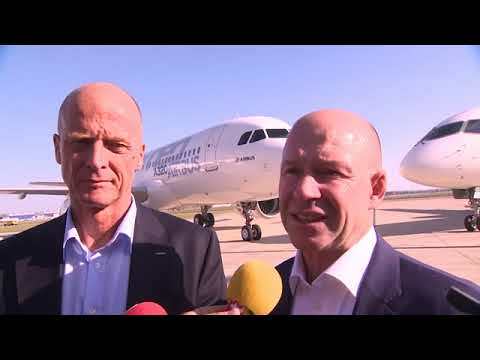 Airbus and Bombardier are to become partners on the C Series aircraft programme. An agreement signed earlier brings together Airbus’ global reach and scale with Bombardier’s newest, state-of-the-art jet aircraft family, positioning both partners to fully unlock the value of the C Series platform and create significant new value for customers, suppliers, employees and shareholders.